I’m Ed Scott, and I work on the Riverford Organic’s founding farm in Devon. The plan is that I’ll be writing a regular farm blog, showing you what we’re growing and how we’re growing it. It’s now the beginning of February, and we are busy picking leeks and the last of our curly kale from the fields. 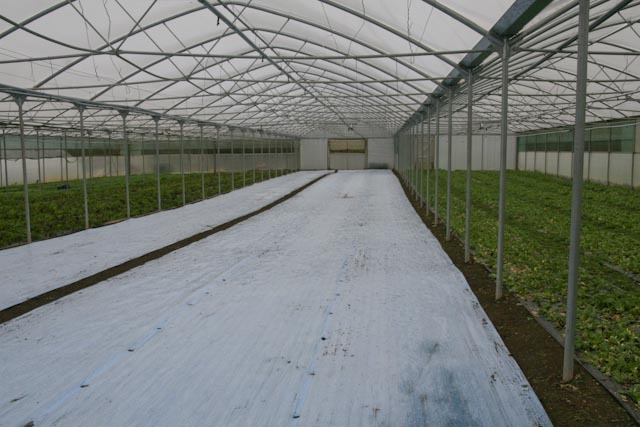 We have also just laid the last of our winter salad pack in the polytunnels. The majority of our salads are block-planted through a plastic mulch, and treated as ‘cut-and-come-again’ crops; these can be picked between three and five times, dependant on type and variety. 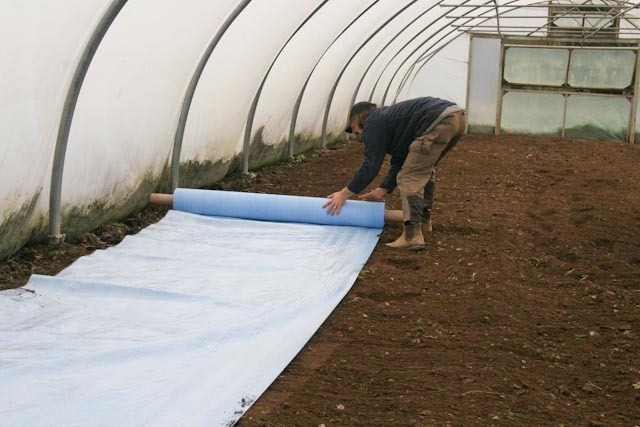 As well as the blocks, a proportion of our salad leaf plants come in seed matting; a large spool of seeds sandwiched between plastic and a blotting-paper like material. Much like cress grown on loo roll at home, upon germination the roots reach through the paper into the soil below, while the leaf pushes up through tiny slits pre-cut in the plastic. This system has the advantage of lower plant and planting costs whilst ensuring the crop is not swamped with weeds; and although we have mixed feelings about the volume of plastic used, it’s actually no more than that used in our traditional block planted system. T he disadvantage of this system is that the seed matting doesn’t work with all plants and can only be cropped once; our first planting went in during October and was harvested in the run-up to Christmas. The rolls laid this week should be ready for harvesting in late March. Keep an eye out for further pictures showing progress through the growing stages.